As the price of registration, gas, and other basic maintenance issues for vehicles continue to rise, it can be easy for drivers to overlook cracks or chips in their auto glass. The problem arises when those cracks along the windshield move from a minor annoyance one day to a completely spider-webbed piece of glass on the freeway the next. There is simply no reason to not utilize the experience of PG mobile auto glass replacement services to get an unsafe problem fixed and a car back on the road. PG has a growing fleet of mobile service vans and trucks that have been offering residents of Southern California peace of mind for over ten years. Due to their loyal customers and expanding business, the prices of replacement auto glass is more affordable than ever. Experienced staff are available to carry out emergency mobile auto glass replacement seven days a week at any time of the day. On top of their 24/7 service, free estimates, and completely mobile service, PG also sticks to only the highest quality materials and parts. Unlike other service companies that stick to aftermarket and OEE glass, PG uses only OE glass as an exact replacement back to factory specifications. This glass has been rigorously tested to meet or exceed all federal safety standards to keep drivers and their passengers safe and secure. PG service vehicles also remove the hassle of calling countless repair shops and expensive tow trucks for a replacement that can be carried out in around 30 minutes. Their mobile auto glass replacement can be done while at school, work, or even in the comfort of one's own home. PG's replacements do not end at popular brands and models. They have also been equipped to deal with a wide array of specialty auto glass including quarter glass, back window, vent glass, T-top glass, sunroof, RV glass, and truck slider glass. With their lifetime guarantee from defects and leaks, PG has taken all of the guess work out of mobile auto glass replacement. Motorists no longer need to struggle through the hassle of expensive repair shops and towing companies. 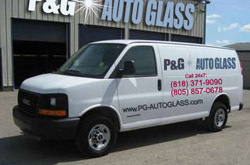 They can now rely on the experience and skill of PG Auto Glass 24 hours a day, 7 days a week.